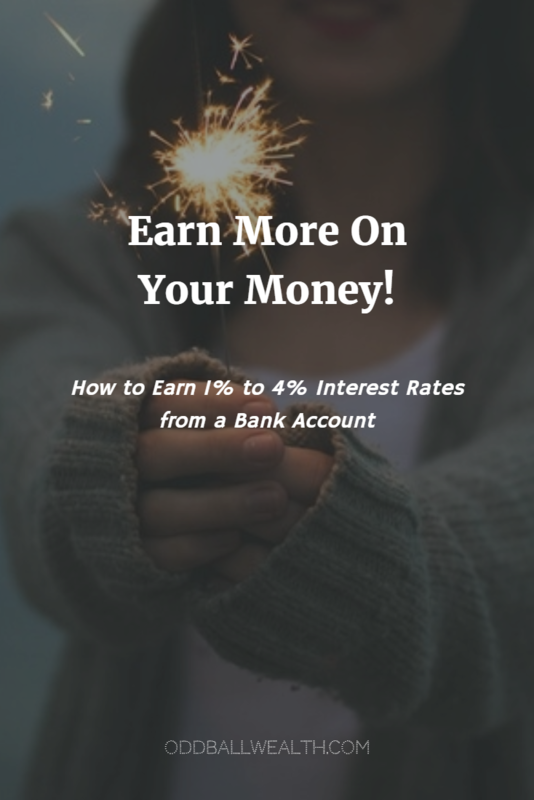 Want know how you can earn 1% to 4% on your money from bank accounts? Banks are considered one of the safest places you can put your money because they offer little to no risk. The stock market is currently very pricey and its future uncertain, and long-term bond yields are dropping, with the 10-year Treasury note yield dropping from 2.2 percent at the beginning of the year to only 1.8 percent currently. Wouldn’t it be nice to avoid risk and a dropping bond yield, and receive up to 4% on your money from the comfort of a bank account? I know it might be hard to believe, but you can! At the end of last year, the fed finally decided that the economy had recovered enough to begin raising rates and did so last December. Even after the fed raised rates, going into 2016 savings rates barely bugged and remain very low, with the average savings account rate at only 0.16 percent. The low rates offered on bank accounts are not only discouraging for savers, but at those low rates you lose money to inflation, and inflation rates are expected to increase more than 2 percent this year. If you look hard enough, there is some light at the end of the tunnel. Although the majority of bank rates are extremely low, a few banks want to brighten your day and offer you a much higher rate, some as much as 4 percent, you just need to know where to look. If you’re looking to earn more on your money from a bank account, look to online-only banks. Online-only banks typically pay more than branch-based banks, a lot more! For example, Discover Bank, which is online-based only, offers a savings account rate five-times the national average, and pays 0.95 percent on savings accounts that have a balance of $500 or more. Another nice thing with Discover’s savings account is there are no monthly balance requirements and absolutely no monthly fees associated with it. Discover Bank savings account offers a great rate with zero strings attached. Best of all, the minimum account balance requirement of $500 is very low compared to other banks, allowing anyone who has at least $500 to save, and get a great rate on their savings, which is five-times the national average! You can open a Discover Bank savings account and get this great savings rate by visiting Discover Bank’s secure website. Want to earn more from your savings, one bank is offering a great rate on their money market account. BBVA Compass Bank offers a generous 1.1 percent rate with their money market, which much higher than the national average rate, which is less than 0.50 percent. There is one catch, to receive the 1.1% rate you need a minimum account balance of $10,000. BBVA Compass Bank does have physical branch locations, but a large portion of their business is online-based banking, and have an outstanding online and mobile banking platform. They give their customers the convenience to go to a physical branch to do their banking or to talk with a banker in person, while also giving you the convenience of an outstanding online banking platform and offering its customers online-based banking rates. You can open a money market account and get the high rate by visiting BBVA Compass Bank’s secure website. The Checking Account with a 4.6% Yield! Earning a 4.6 percent yield on any bank account is generally unheard of, let alone on a checking account. Currently, you’re extremely lucky if you can get that kind of a return from the stock market, since you probably have a better chance of losing 4.6 percent in the stock market rather than yielding it. Which is why yielding 4.6 percent on a checking account is usually a rate most only dream about, but Consumers Credit Union, which is based in Gurnee, Illinois offers a rewards checking account that yields just that, 4.6 percent! Although, there are some limitations and requirements. You can only receive the 4.6% yield on up to $20,000, and in order to receive that yield there are a few rules and requirements you have to follow. First, you have to spend at least $1,000 a month on their CCU credit card, you’re required to do a certain amount of online banking, make a minimum of 12 debit card transactions every month, and there is a $5 fee to join the credit union. Can You Receive a Decent Rate on CDs? Most Certificate of deposit accounts, otherwise called “CDs”, rates are still very low, with CD rates averaging only 0.63 percent. Although, I found a few banks (online-based banks) offering rates as high as 2.27 percent, which still isn’t as high as the checking account yield above, but these CDs don’t have the limitations and requirements that go along with the checking account I listed above. Also, these CD rates are with national banks that offer advance online banking platforms, apps, and 24/7 customer service. Whereas the checking account above is only offered by a small credit union, and only has a few branch locations which are only in Illinois, a basic online banking platform, and customer service calls are limited to the staff that works at the few physical branch locations, which can only be reached Monday through Friday, during the hours of 9 AM to 5 PM. Unless you live nearby that credit union, you’re probably better off with one of these CD’s. Today’s rates on CDs won’t yield you 4.6 percent like the high rate checking account above, but I’ve found a couple banks offering high-rate CD’s, up to 2.27 percent. If you’ve heard of a CD ladder, then you probably know what I’m talking about. Let me give you an example of a CD ladder, say you have $10,000, you take that and split it up into five $2,000 portions, and then you purchase five CDs with it, which mature in one, two, three, four, and five years. As soon as one certificate of deposit matures, take the proceeds and purchase another five-year CD, and if interest increases you’re able to take advantage of higher interest rates and yields on your money. For shorter-term CDs under two years, BBVA Compass Bank offers better rates than most. On a BBVA Compass Bank 13-month CD you can currently earn a 1.25 percent rate, or you can get an even higher rate on their 23-month CD, which at the time I’m writing this offers a rate of 1.35 percent. Click here view an up-to-date chart of their current CD rates, on Discover Bank’s secure website. If you want a CD that matures in two-years or less, you’re better off with a 13-month CD or 23-month from BBVA Compass Bank, as their shorter term CD rates are higher than Discover Bank’s. That’s amazing! 4.6% interest rates. It’s crazy how most banks are still offering practically nothing. Its more risky, but I like using Betterment’s conservative investments (although they still may not be as good as these banks). Thanks for sharing! I have some research to do now. If you look hard, you can usually find some bank that is trying to get more market share in your market that will offer good rates on their checking accounts. We had a bank around here offer 3% for a long time as long as you had so many debit card transactions. The unfortunate part of these accounts is things will end at some point so you need to weigh if it is worth jumping over for the short-term returns or not. I personally use an online bank for my cash savings. While the rate isn’t the highest out there, I have found other benefits in the program that makes it worth it for me! Great tips! Great find on the CCU card! Do you know anyone currently doing that? Thanks Millennial Boss! No, I do not know anyone personally doing the Consumers Credit Union deal unfortunately. I was just digging around and doing some research when I stumbled upon them, It was by the the highest yielding bank / credit union offer I could find for a standard savings / checking account. Since they’re a credit union, the services they offer seem to be limited to those living near their physical branch locations, which are in Illinois, otherwise I would have jumped on the deal. Any regular bank account which yields more than 4% is amazing! That’s fantastic!! So glad I live near Gurnee!! I will definitely be checking out that account. I’m not 100% sure it’s practical for me just yet, but definitely good to know about. Thank you! !